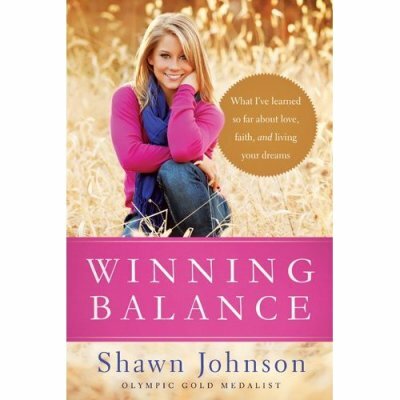 Olympic gold-medal gymnast and "Dancing With the Stars" champion Shawn Johnson talks about growing in her Christian faith and learning to trust in God in her memoir, Winning Balance: What I've Learned So Far About Love, Faith and Living Your Dreams. In her story of trial and triumph, Johnson reflects on the lessons she's learned at key moments in her life as she shares prayers or verses that have helped her. One lesson that Johnson learned during the 2008 Beijing Olympics was finding her self-worth outside of the color of her ribbon. When she learned that Olympic teammate Nastia Liukin beat her by six tenths of a point, winning the gold in the women's all-around, Johnson said she felt "confused, happy and upset." But upon reflection, Johnson found that losing the all-around helped her learn that her worth came from God, not a medal. "God created you in his image; that is where your worth comes from," she wrote. Speaking in an interview with The Christian Post this week, the 20-year-old explained how her faith grew during that experience. "I'd say my faith grew during that time because I had to find a reason for everything," Johnson told CP. "You know, if you make one thing too big, as soon as it's taken away from you or something doesn't go as you planned it, instead of being like 'Oh, poor me,' I've found a greater reason for why. It was always: everything happens for a reason under Him. It just kind of helped clarified things and helped me see things a little better." Johnson said her faith has grown over time. Growing up, Johnson's parents freely spoke to her about God but didn't emphasize weekly church attendance. Sunday was her only day off from the gym so her parents wanted it to be spent with family. But they still taught her to look to Him as a source of comfort and peace through all of life's ups and downs. Her mom always encouraged her to say her prayers every night, and had the famous children's bedtime prayer painted on her wall. In more recent years, she and her family have been trying to attend Lutheran Church of Hope more regularly. She said she felt that God became more "real" as she and her boyfriend Ryan talked about their faith and as she reflected on the Bible more. She also learned how to trust in God from observing her boyfriend's family deal with his sister's cancer, which later went into remission. "They were always positive and taught me to leave everything to God, because when we try to manage everything on our own, it's too much for us to handle," said Johnson. That lesson also became handy when things in her life got tough – and unpredictable. In 2010, she suffered a career-threatening injury after a skiing accident. She attempted a comeback to gymnastics and was overwhelmed as she tried to balance her rehab, training, and commitments to sponsors. During that time, she was reminded to leave everything up to God. "Trust that God will walk with you through the hard times. Be grateful for the many ways he is working out all the details of your life so you can make the most of the gifts and opportunities he's given you." At the time the book was written, Johnson was trying to make the 2012 London Olympics team but she has since announced her retirement from gymnastics. Instead of competing, Johnson will attend this summer's Olympics as a sports commentator. Afterwards, she has plans to go to college. As she looks to the next chapter of her life, Johnson told CP she looks to her favorite Bible verse from James 4:6, "He gives us even more grace...As the Scriptures say, 'God opposes the proud but shows favor to the humble." CP: In your book, you talk about love, faith and living your dreams. Can you tell us one life lesson you've learned in each area? Johnson: I'd say, living your dreams is just about following your heart and having fun and doing what you love. I fell in love with gymnastics when I was three years old. It took me to amazing places. Faith – that there's nothing more important in your life. You have to have something to fall back on and my faith has been the one constant through everything. Love – again that's the one constant you need in your life – my family, my friends, everything. I mean, if someone truly loves you, they'll always be there for you. CP: You also spoke about the trials you experienced during the 2008 Beijing Olympics, from being away from your parents to being a little upset from not winning the Gold medal in the all-around, and how your faith got you through that. Can you speak about how your faith grew during that time? Johnson: I'd say my faith grew during that time because I had to find a reason for everything. You know, if you make one thing too big, as soon as it's taken away from you or something doesn't go as you planned it, instead of being like "Oh, poor me," I've found a greater reason for why. It was always: everything happens for a reason under Him. It just kind of helped clarified things and helped me see things a little better. CP: You wrote about finding your identity and self-worth in something other than gymnastics or winning a medal. Can you speak a little more about that? Johnson: Yea. Throughout the Olympic Games, I learned that your worth and identity isn't solely based on a color of a medal or a score a judge gives you. It's about what's inside. Going outside of gymnastics, I've learned that I'm more than just a gymnast. Up until the games, I thought that I wasn't anything except that. I think it takes a while for people to learn that but I'm glad I did. CP: From your childhood until now, what are some things that has helped you grow in your relationship with God. You mentioned some in the book. Can you share some with us? Johnson: A lot of it has just come over time on my own. Traveling so much by myself and not having my family there, it kind of evolved on its own. My friends and a lot of family members around me took me to church and gave me devotions and just kind of led by example, and I followed. CP: You have said that your parents have been this stable force in your life. What are some lessons they have taught you from being a good person to excelling as an athlete? Johnson: I'd say one thing my parents always stressed is to be true to who you are. You know, especially, when kids grow up they always try to be someone or be like someone. My parents never wanted that. They wanted me to be unique. They wanted me to be my own person and just follow my heart and be happy. They continue to teach me things on a daily basis. CP: Your book is titled Winning Balance. I'm assuming it's talking about how to balance things in life like love and faith. What is the "winning balance" that you have found to work for you? Johnson: You know, it's not like I've found the balance. The book is about finding it and looking for it and trying to live it. Finding a balance between your career, your faith and your love and everything. Just everything in your life. CP: You recently announced that you're retiring from gymnastics. It must have been hard to come to that decision. What will you do next? Johnson: I'm not really sure what I'm going to do next yet for the rest of my life. I'll be in London for the entire duration, working, doing commentating work and hosting, working with sponsors, and then going to college afterwards. CP: Can you share with us a Bible verse that has inspired you as an athlete or has helped you as you look into the next chapter of your life? Johnson: I have a few but one of my favorites is James 4:6. Simply put, it says God gives grace to those who are humble. So, since 2008, it's always been the verse I've always gone back to. CP: There are people who are watching, not just young girls but people who have found your story really inspiring. At such a young age, you've been the Olympics, won four medals – one Gold, three Silver – and also you won the "Dancing With the Stars" competition. What would you say to them about following their dreams that would inspire them? Johnson: Just nothing is impossible. Even when I was little, I believed that I would never make it to the Olympics, that I would never become one of the great success stories. I just loved gymnastics and continue at the recreational level. But if you work hard enough for something and you truly have a passion for it, you could be the next "Dancing With the Stars" winner or Olympic champion. CP: Well, thanks so much for joining us. We wish you all the best of luck and blessing for the future!